HMS Industrial Networks now adds the M.2 format to the IXXAT INpact PC-card range. The result is the smallest PC-interface for Industrial Ethernet and Profibus on the market. With the new IXXAT INpact M.2 interfaces, users can implement PROFINET, EtherNet/IP, EtherCAT, Modbus-TCP, Powerlink and PROFIBUS slave connectivity with the smallest footprint ever. The compact form factor M.2 2260 (Key B-M) makes INpact M.2 suitable for small and mobile devices, typically used for service, configuration, data analysis or process data visualization purposes. INpact M.2 also fits well in modern embedded computer-based controllers, where it enables direct and easy connectivity to desired industrial networks. Same as for all IXXAT INpact cards, the INpact M.2 comes with a comprehensive driver package for Windows, Linux, INtime and QNX, offering an easy and fast development process. A uniform programming interface allows customers to switch seamlessly between different INpact cards and protocols without changing the software. The effect is increased flexibility and a significant reduction of development costs. 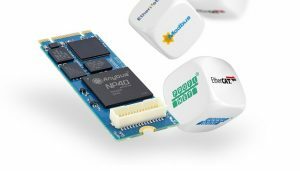 The multi-network capability of the INpact is based on the proven Anybus CompactCom technology, in which the FPGA-based Anybus NP40 network processor provides all functionality required to handle communication between the Industrial Ethernet or fieldbus network and the customer application. The solution features real-time performance, making it ideal for demanding industrial applications. INpact M.2 is available as finalized product with pre-installed network protocol, but it also features a flexible, multi-protocol Common Ethernet version which enables users to save storage cost. Economy of scale is achieved since users can simply select and upload the desired Industrial Ethernet protocol to the INpact by themselves depending on end customer networking needs. The connection of INpact M.2 to the fieldbus or Industrial Ethernet network is done through a special bus interface board, connected via cable to the IXXAT INpact M.2. The INpact M.2, bus interface board, cable and mini bracket comes in a ready-made kit, but can also be purchased separately, if desired.